Lived at Ivy Bank farm, Middleton Road, Glenside. Max Dorset‘s historic farmhouse with its sheltered front porch was a place where friends and neighbours were welcome to visit and talk. Here visitors would enjoy a cup of tea made with water that Max hand-carried from a farm spring. Surrounded by regenerating bush, old variety fruit trees and wild roses, life here was a different world. It was miles from the city where Max’s daily routine into his nineties, was a morning constitutional swim in Oriental Bay. Max was born in 1917 at Woodville, the youngest of seven children to William and Agnes Dorset. 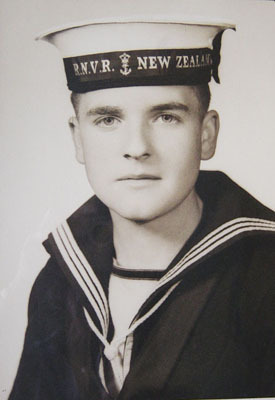 He was known by his family as “Ted” but later preferred to be known by his Royal NZ Navy nick-name of “Max”. When he was born, his parents owned the Ballance General Store. When he was a young boy, less than five years old, the family moved to Flaxmere, a Dorset dairy farm at Opaki in the Wairarapa. His father sold the farm when Max was about ten years old and the family moved to Masterton where his father became a money lender. After leaving home Max studied papers from Victoria College (now Victoria University) extramurally. He wanted to be a Doctor. He was inspired by his great grandfather William Dorset’s brother, Dr John Dorset. Dr John Dorset migrated to New Zealand in 1839 and Fort Dorset, now Point Dorset was named for him. “There were too many Doctors and I was encouraged to take up Chemistry instead,” Max said. He gained his BSc. He worked for the Government in War Pensions and from there enlisted in the Navy. After his WW II Naval Service he purchased Ivy Bank Farm at Glenside from the Rowell family. Conversations with Max centred around the weather, the state of the roads, the latest in politics and horse racing. He said his love of horse racing was through a Dorset relative from the Wairarapa, who won the Wellington Cup three times in 1909, 1913, and 1919. He enjoyed speaking Latin and would quote it along with lines of his favourite poetry and lyrics of memorable songs. Max spent the last weeks of his life living in retirement at Masterton with his older sister Emily. He died at the age of 94 and was buried beside his parents in the Archer Cemetery in Masterton.